The follow up album to the critically acclaimed Dog Vs Cat Scratch Record, now in it’s second pressing. DJ Craze, Swamp, Qbert and many other well known DJ’s have two copies of the Dog Vs Cat Scratch Record. This record is now available digitally in this collection of songs. If one is using Stanton™ Final Scratch™ or Serato™ Scratch Live™, this is your opportunity to have your very own digital copy of the infamous scratch record for a fraction of the cost of the vinyl. 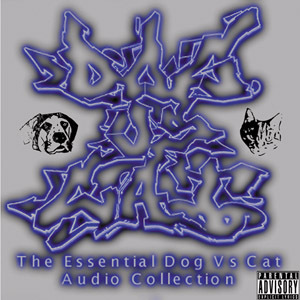 The Essential Dog Vs Cat Audio Collection also contains a large collection of songs performed live by Dog Vs Cat on their tour of the Northeastern United States which created thousands of loyal fans. Often the group would donate part of the proceeds to area no-kill animal shelters. Dog Vs Cat also held special shows that fans could bring their pets to! The Dog Vs Cat clothing line continues to grow with t-shirts, different designs of hooded sweatshirts, several hats and stocking caps, sweat rags, wrist bands and more. Dog Vs Cat performances incorporate live electronic instrumentation by T0B0R; via keyboards, sequencers, drum machines and samplers alongside the Turntablism techniques of renowned DJ MekaDog. MC Wally Boy Wonder incorporates his unique style of flow for some of the tracks, making for an overall enjoyable audio experience. All programming and instrumentation by: T0b0R & MekaDog. Wally Boy Wonder appears vocally on seven tracks.